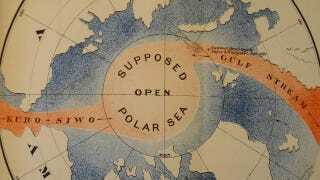 The Open Polar Sea, a balmy aquatic Eden at the North Pole? A warm sea at the North Pole — it's a bizarre idea, but one several individuals sought and gave their lives to find for financial gain and the glory of their home countries. Explorers romanticized the existence of a Open Polar Sea during the 1500s, creating farfetched theories of its existence and losing a number of sailors to the harsh truth of the icy wasteland they encountered. Sailors believed an open body of water would create an easy-to-navigate passage between Europe and Northern Asia. Robert Thorne, an Englishman, sent two ships looking for a northwest passage to India via the North Pole in 1527. Thorne pleaded with Henry VIII for financing, arguing that British use of a Polar Sea would shave 10,000 kilometers off the typical route to Asia, thus giving the English an advantage over Spanish and Portuguese shipping crews. Although the idea seems bizarre, several 16th-century theories bolstered belief in an Open Polar Sea. Geographer William Bourne suggested in 1580 that the long summer days in the North Pole would create enough energy to thaw the ice and create an "Arctic Ocean." The 16th-century British explorer John Davis posited that large bodies of ice could only be formed in freshwater. As the North Pole is thousands of miles from a freshwater source, the further north one went, the more likely it would be that they hit saltwater (and not freshwater) turned into ice. The most bizarre theory of this time claimed that Earth's temperatures declined abruptly prior to the North Pole, creating a temperate area on par with the Equator. Thorne's 1527 expedition yielded no success, with one ship lost and the other severely damaged during the the journey. As eight more ships traveled in search of the Polar Sea in the coming decades, all encountered impassable ice. Belief in the Open Polar Sea theory subsided until the mid-1800s, when Elisha Kent Kane set forth on a number of expeditions north with hopes of finding this theorized body of water. Not a speck of ice...As far as I could discern, the sea was open...The wind was due N(orth) - enough to make white caps, and the surf broke in on the rocks in regular breakers. Morton, however, did not find the Open Polar Sea — he found a small oasis of water. Morton's quote is likely tinged with a desire to raise the spirits of his boss, Kane, who saw the Polar Sea as a possible utopia, an area brimming with life amidst a harsh arctic world. Hopes for the undiscovered Polar Sea died with a 1879 expedition led by American Naval Officer George Washington de Long. Lieutenant Commander de Long led his crew of 19 from San Francisco to their deaths after spending fourteen months trapped in ice in the Bering Strait. This would be the last major expedition to the elusive Open Polar Sea. Nowadays technology and the affects of climate change have spurred modern interest in an Arctic passage. Ice-breaker ships are used to open channels between scientific research stations located in Antarctica, making a path where one did not exist and allowing for the transport of goods. Furthermore, satellite imaging shows the North Pole to be ice-covered during the winter, with the ice subsiding in the spring and summer. Over time, temperature trends could create a seasonably traversable stretch of water from Europe to the Pacific Ocean by way of Northern Russia — the same route explorers searched for centuries ago. The top image is of a 19th Century circumpolar map, courtesy of the Rauner Special Collections Library at Darthmouth College. Additional images courtesy of Nicky Webster/CC and Dartmouth College, while the ice-breaker ship video is courtesy of sujpaul1/YouTube. Sources linked within the article.